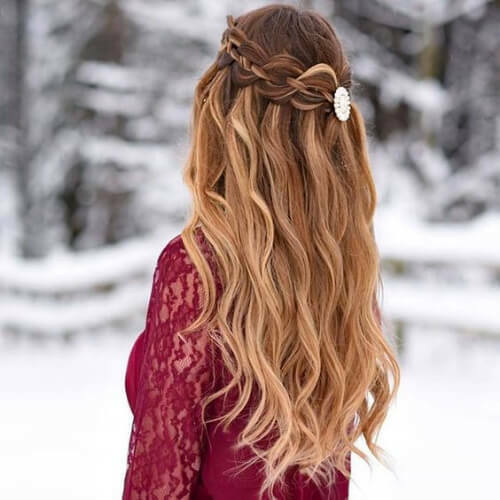 Apart from the fact that it’s absolutely mesmerizing to look at, the waterfall braid with curls style has one more advantage. It’s incredibly versatile. This means that you can wear it both at the office on a casual working day and for a special event in your life such as a wedding or your prom. 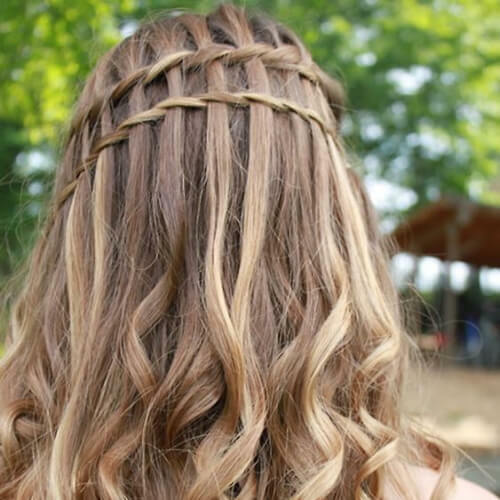 Take a look below at the 50 captivating waterfall braid with curls ideas that we’ve put together for you! 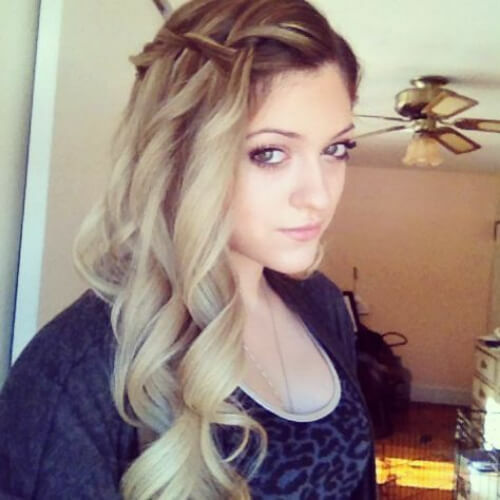 The waterfall braid with curls is such an amazing hairstyle that it manages to embellish every kind of hair out there. Therefore, if you like to wear your hair natural but fear it might be a bit lackluster, don’t worry! 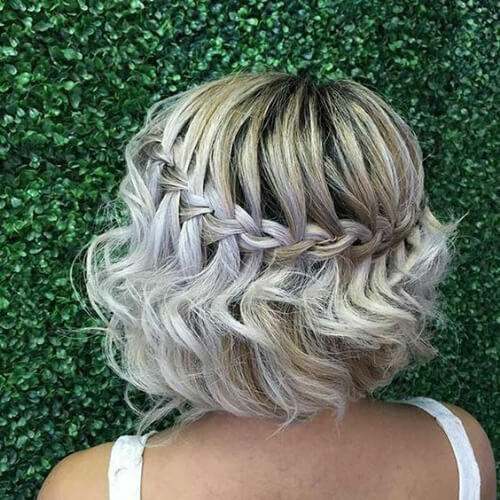 This gorgeous example used strands of hair from beneath to create the braid itself. They are darker in color than the blonde on top, which makes for outstanding contrast. In a way, it seems as if the braid is not even real. If you have a rich and lavish hair color such as this honey blonde, you absolutely must show it off. 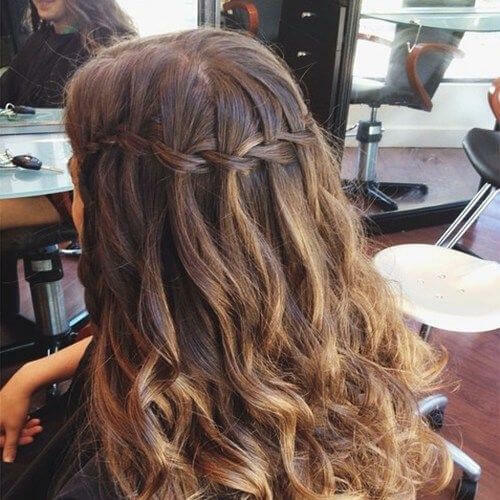 And, what better way to do that than with a waterfall set of curls. It will make you look like the princess you know you are. Copper has been the go-to color for quite a while now. It has a sister called brass, but they can be quite tricky to get at home, so we advise you to see your stylist for this one unless you want to walk around with orange hair. 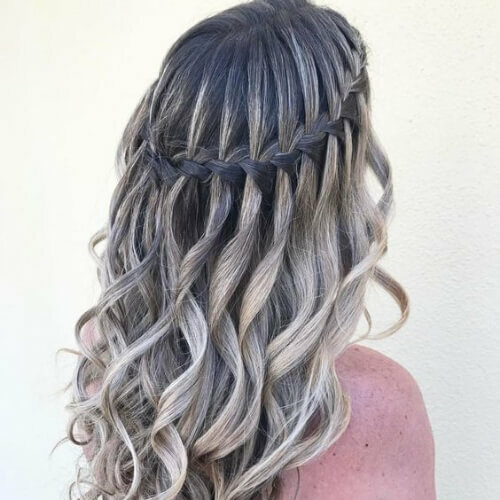 If you want to take your waterfall hairstyle to the next level and add some 3D effects to it, you can always wear highlights. Go for a set that is in high contrast to your base color, such as these red ones as opposed to the base dark brown. Isn’t this just the perfect color to carry you from autumn to winter? It isn’t always easy to find the perfect shade that matches that short period between the cold seasons, but we believe we have just the thing for you. 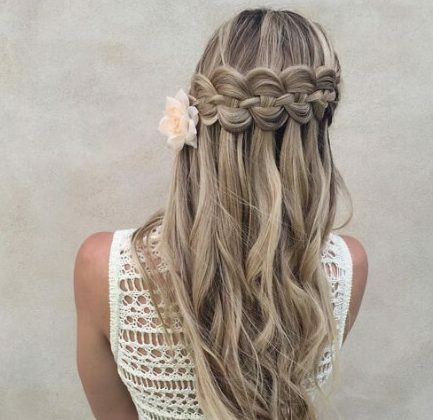 It’s important to note that a waterfall braid doesn’t necessarily have to be a fishtail style. You can braid or twist it in any way you like. 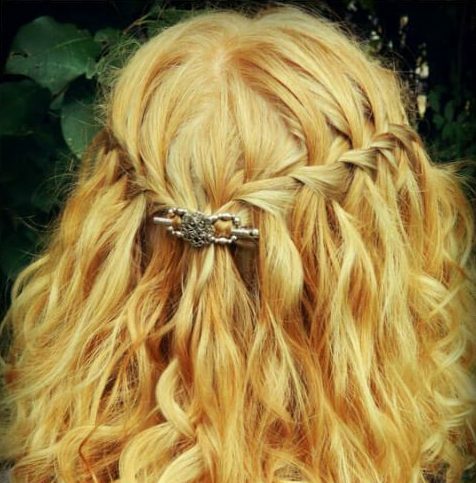 This, for example, is a twisted crown braid that produces the same waterfall effect on the hair. The same goes for where you place it. You don’t always have to place it at the back of your head. You can also do it diagonally on one side if you want. 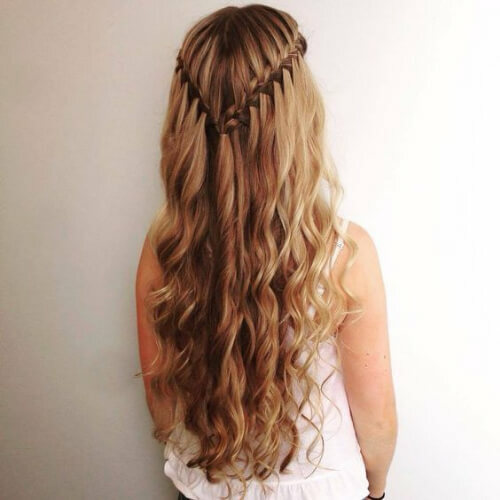 It is still considered a waterfall braid with curls. 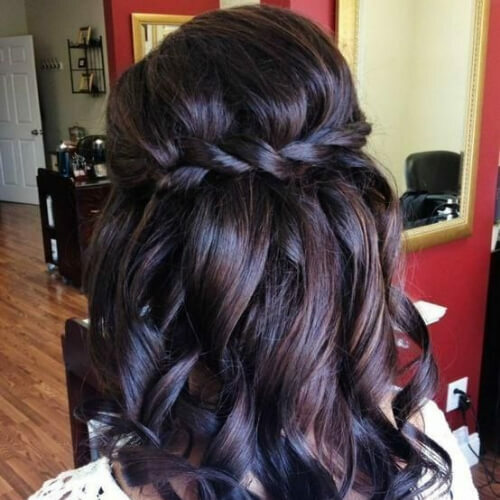 The bottom line is that you can get as creative as you want with this hairstyle. 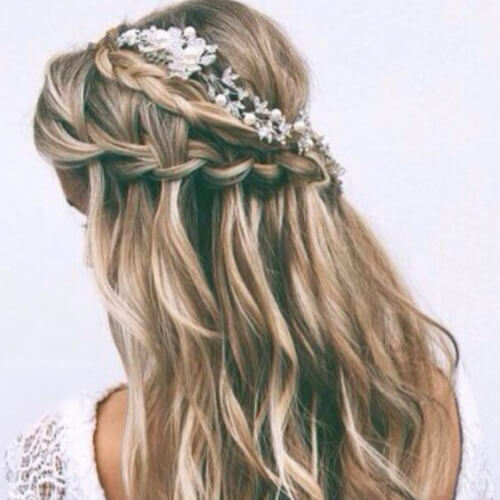 If you’re wearing it as your bridal hairdo, why not go for a double braid topped with a small flower crown made of white baby breaths? 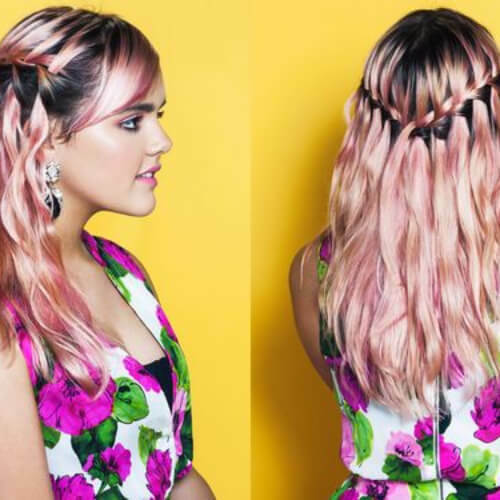 This jumbo braid is easier to do than you think. All you have to do is create the French braid and then pull at it using your fingers until it gets to the volume you want it to be. You can also make it as messy as you want in the same way. 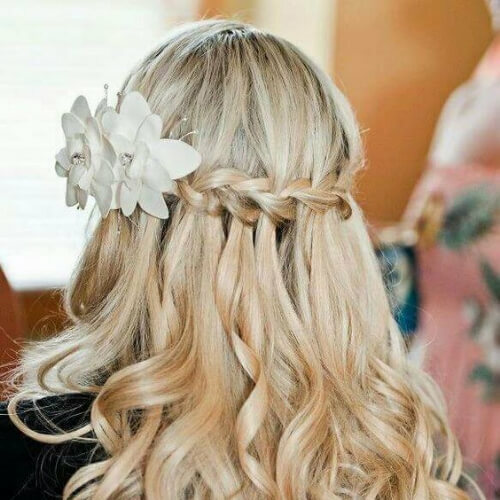 Another great thing that you can do is embellish your braid with different accessories depending on your outfit or the function you are attending. These little stars are sweet and feminine, not to mention romantic. 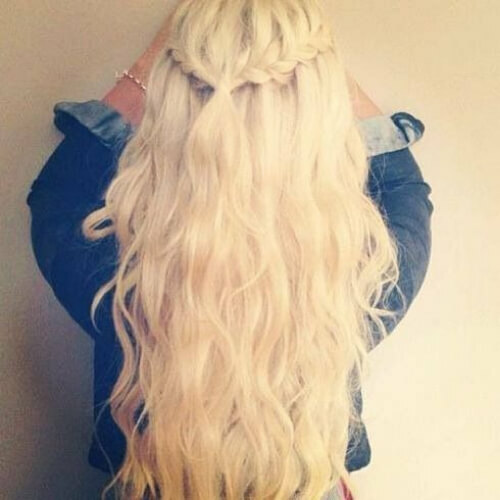 A double waterfall braid can also mean going for this V-shape at the back of your head. Try a French braid, a Dutch braid or even a simple three-strand braid. As long as you achieve the waterfall effect, you’re good to go. On your big day, it’s all about you. It’s the one day when you can go all out, get all dolled up and look like a princess. Your hair can receive the same treatment so don’t hold back on the hair pieces and rhinestones. We are absolutely in love with this honey blonde and chocolate brown ombre. The colors melt into one another like a high-end dessert. Therefore, we advise you to try this combination as soon as possible. It should come as no surprise to anyone by now that extreme blondes have been the utmost trend as far as hair is concerned this year. Everywhere you look, girls are wearing some shade of platinum or iceberg blonde. 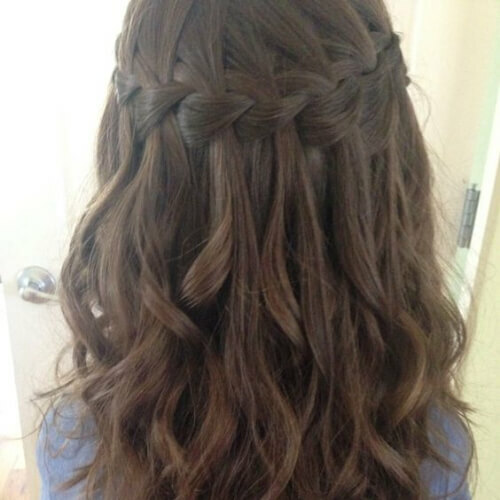 Trying a waterfall braid and curls on a little girl with long hair will make her look like the princess that she is. And, if you add a flower in her hair, things will only get better. Ask her to choose her favorite hair accessories. We’ve seen a lot of trends on the rise concerning bangs this year and braiding them is just an example. They look fabulous and not that difficult to pull off it you have a little time and skill to learn how to do it. 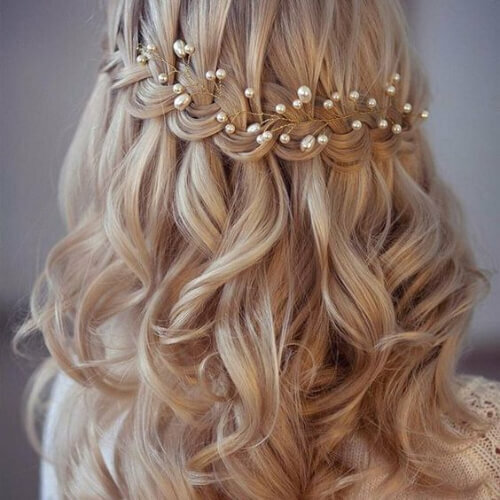 Another way in which you can embellish your waterfall braid with curls is by wearing a simple satin ribbon in your hair like you used to do when you were a little girl. Choose a muted and demure color to avoid the infantile look. Is there anything better than flaunting your natural hair color? 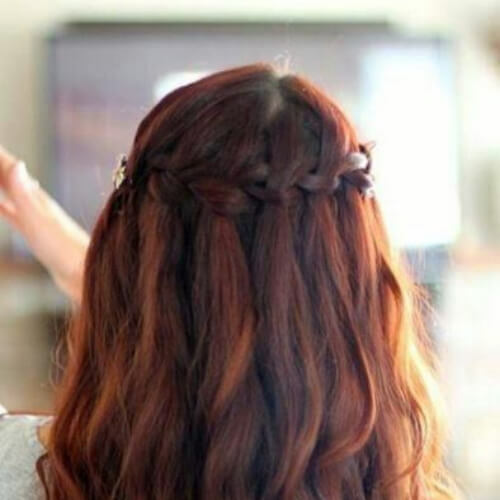 If you were blessed with natural red hair, show it off! Go for some blonde or strawberry highlights to make matters more interesting and add some dimension to your hair color. Since we’re on the topic of colors, here’s a dark cocoa brown that absolutely had us swooning. If you look closely you will see that it also has a few streaks of eggplant mauve running through it to make it even richer. 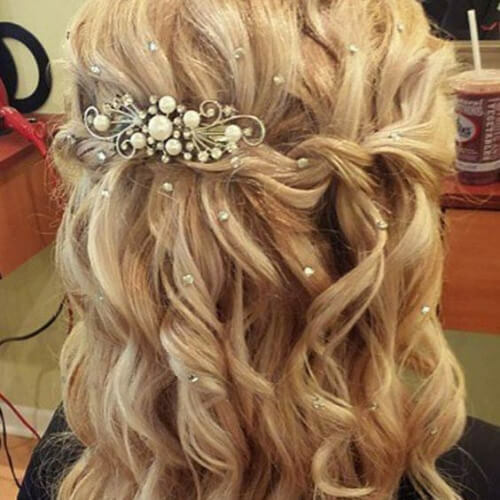 Here’s a typical bridal hairstyle with a golden hairpiece adorned with pearls. 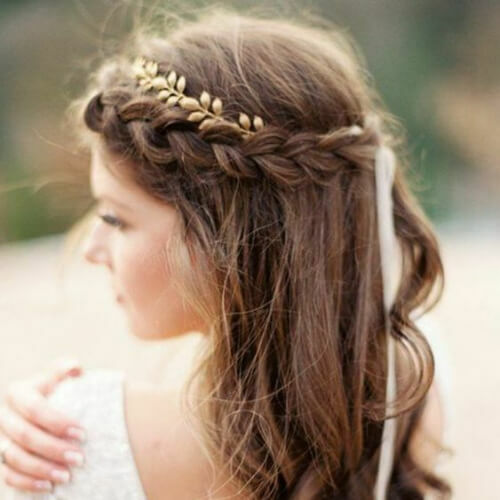 The elegant accessory molds perfectly onto the braided crown and ensures that you look perfect on your big day. 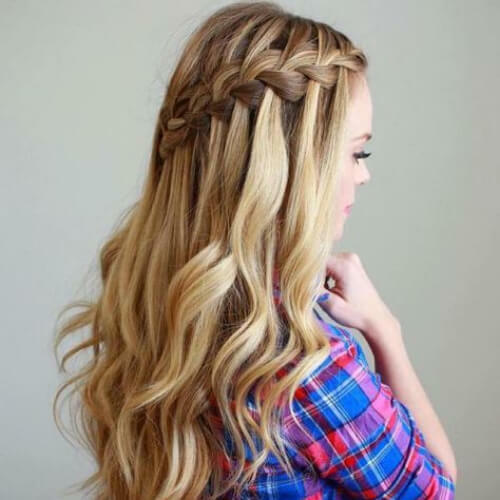 This style is called the crossover waterfall braid. The reason is the way you braid your hair which asks for strands of hair to cross over one another until you get to this result. If you can’t do it on your own, ask your stylist. 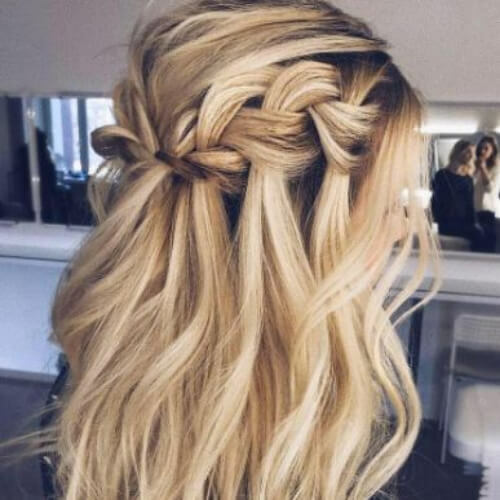 This hairstyle will ensure that you get the most beautiful pics for your Instagram account. So make sure you ask your friends to take as many pictures of you from behind as possible because this is one for the books. This flower crown made of white thistles is every bride’s dream if you’re having a country wedding. The thistles represent the nature that surrounds you as you say ‘I do’ outside, in the hot summer sun. This is how a four-strand braid looks like. It’s quite impressive once you master it to perfection. Add a flower at one end to make it even more striking. You’ll stand out as the one with the best hair wherever you go. Here’s a version that you can definitely learn how to do on your own and then wear every day, even at the office. 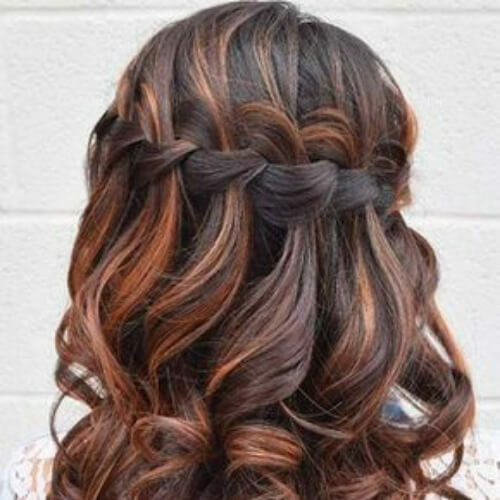 It’s a simple twist at the back, but one that has the same waterfall effect on your curly hair. A reverse ombre is one that has the darker color on the bottom and the lighter one at the roots rather than the other way around as is the traditional way. It looks edgy and bold, no matter which hair colors you choose. 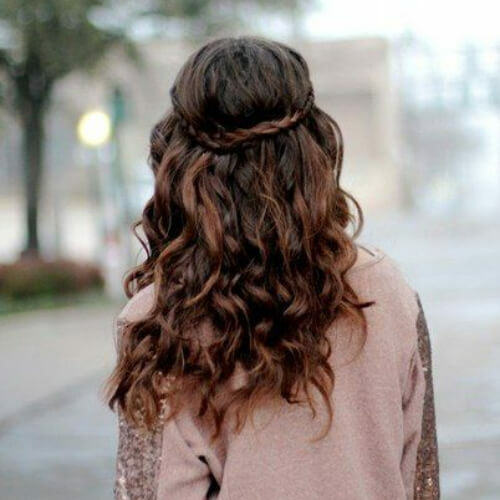 The waterfall braid with curls doesn’t automatically mean that you have to have long or even medium hair to pull it off. In fact, if your hair has enough volume, you can get the same type of curls with a shoulder-length bob. The matte ombre trend has to be one of the most beautiful hair trends we have ever seen. 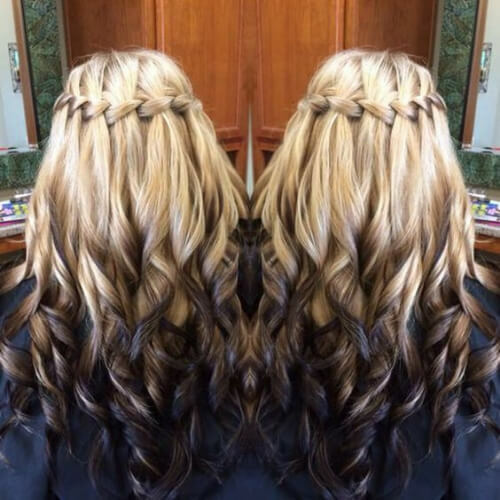 The top part of the mane is colored in a gorgeous matte chocolate brown that melts into a pool of beige blonde. 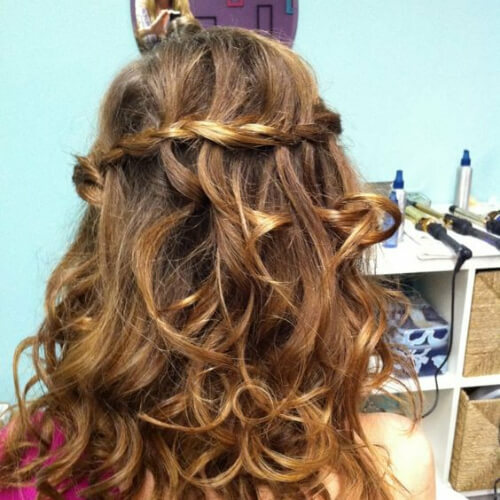 Prom is one of the main events at which girls wear the waterfall braid. Remember you can always embellish yours with rhinestones, jewelry, and flowers that match the ones in your corsage. Even though rose gold has taken a step back as the number one hair color, that doesn’t mean you can’t still wear it. 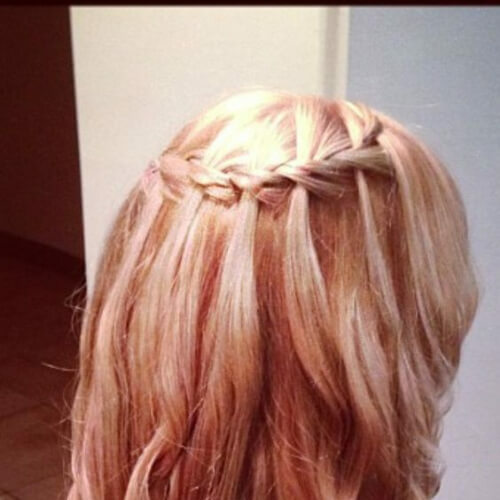 Rose gold looks amazing still as a metallic hair color, especially when you put your mane up in a waterfall braid. Oversized flowers are clearly meant for special events. We advise you to get some faux ones if the event will last a very long time. If you do go for the natural ones, try some that smell good. In this way, you benefit from their perfume. 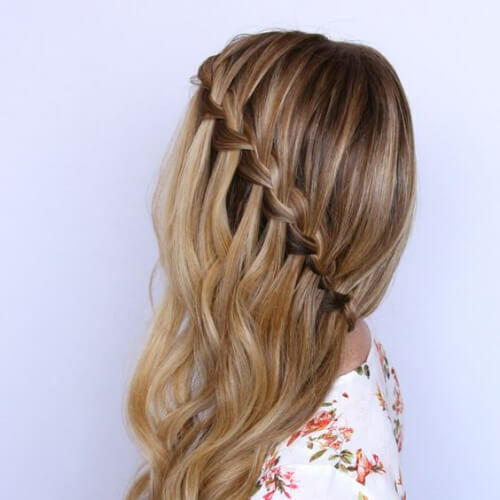 Here’s yet another type of braid you can try. This is a thin twist that has actually been doubled. And you know what that means. Double the wow effect! 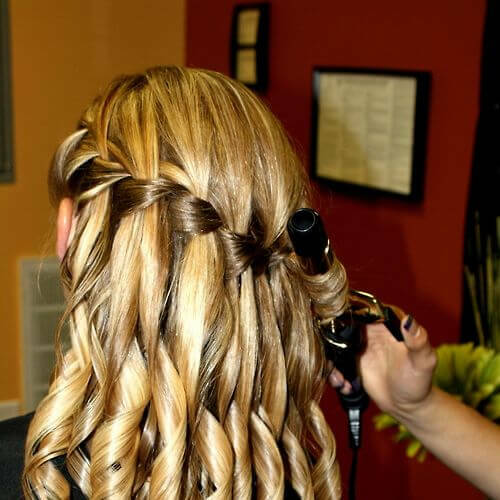 Use a hair curler to get those light curls in your hair. We’re back to your wedding day with this amazing idea. 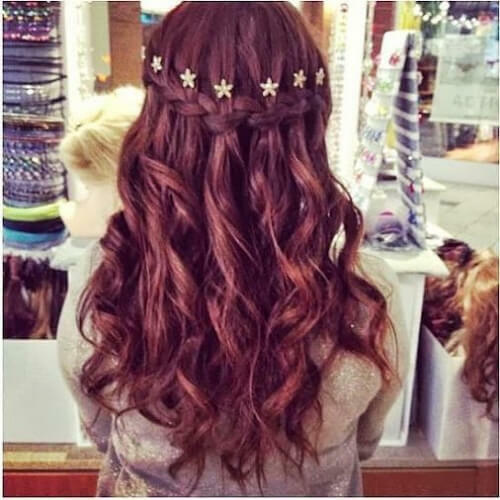 It consists of a waterfall braid and curls plus a metallic headband in the shaped of golden bay leaves. And did you notice the white satin ribbon at the back? 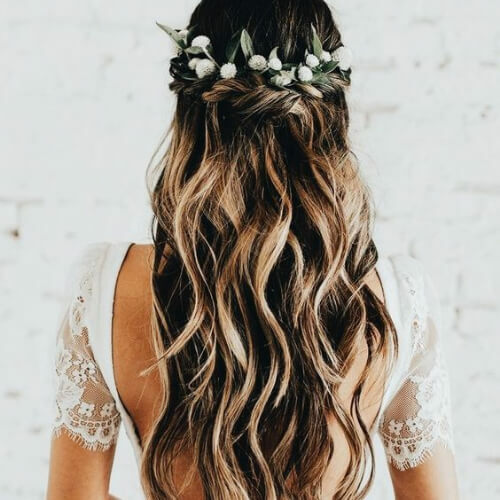 This diagonal braid may be the answer to your prayers in case you have a wedding dress with a gorgeous back that needs to be displayed. 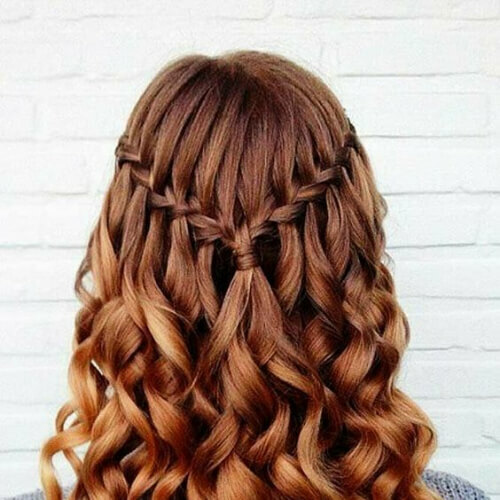 Braid it sideways so that your curls don’t hide away the lace and detailing. There’s a very high feeling of satisfaction about getting all your curls to look even and exactly the same. It takes a lot of practice, but when you reach that level of perfection it makes you feel like a real hairdresser. 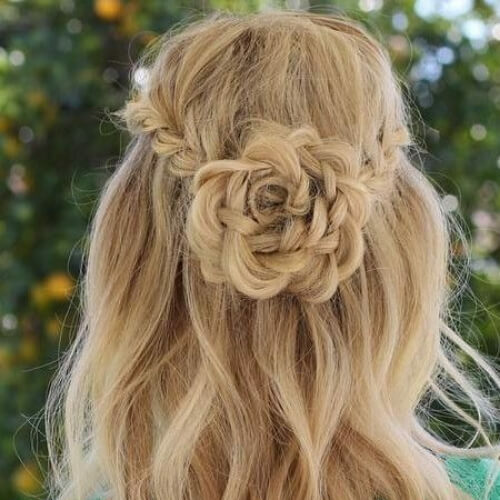 This is such a romantic hairstyle! We can see it now bundled up with a thick woolen scarf and cozy overcoat as you step over crunchy leaves on the sidewalk. What’s missing? A pumpkin spiced latte, of course! 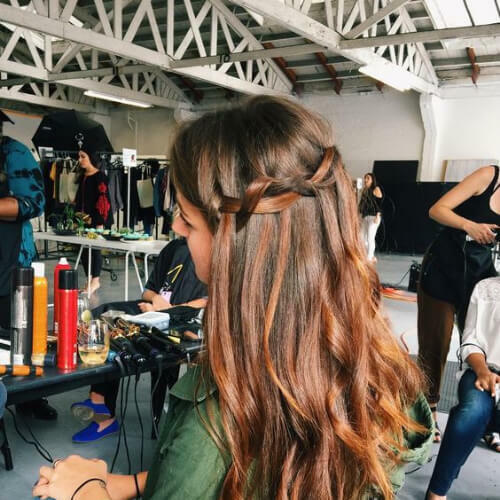 Not every waterfall braid that you create has to be perfect. Some can be messy by design or even unintentionally. No one will know as long as you disguise it well enough! Messy is a trend now! 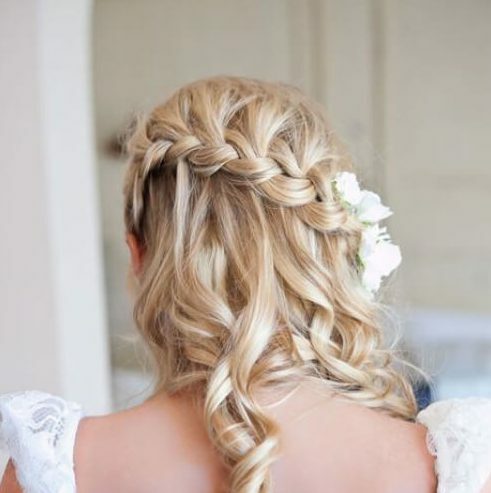 A braid crown is when you braid all your hair starting from the temples and going all the way around to the back. 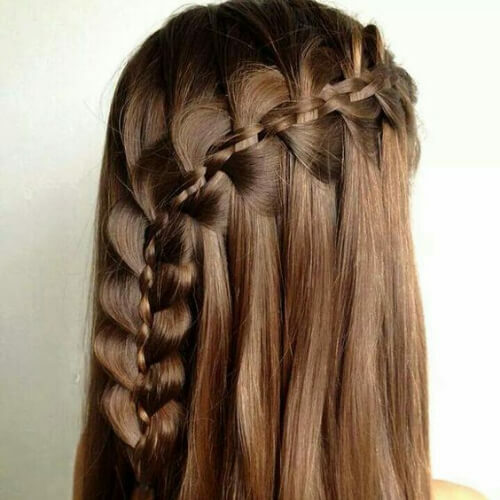 You can choose any kind of braiding you like, as long as you get the same waterfall effect we all know and love. If your hair is not thick enough to pull off this trend, you can always get some extensions. Clip ins will do the trick wonderfully. Plus, you can take them off very easily whenever you’re tired of having them on. The secret to loose curls is that you don’t even need a hair curler. You can braid your hair at night after washing it and sleep on it. In the morning, after releasing it, you will have some rather loose curls. 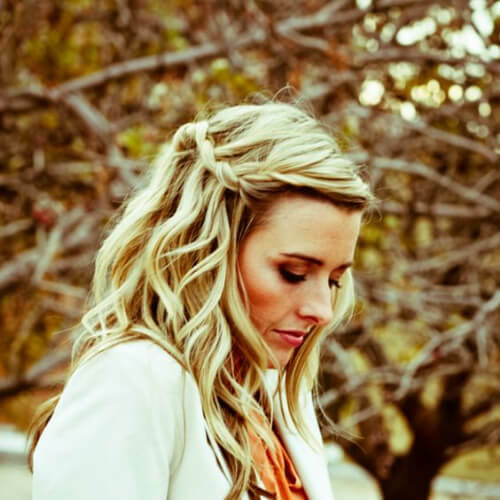 Some waterfall braids are so easy that you learn how to do them yourself right at home. All you need is to find the right hairstyle tutorial on YouTube and then have enough patience to learn how to do them. The dirty blonde hair color has one major advantage to it. It can suffer a lot of changes. Plus, you can take a lot of time between your trips to the stylist. If you go for brown roots, you can even grow your hair out without anyone noticing. Taking the waterfall braid one step further also means coloring your hair in a non-natural color, such as this matte ink blue. You can get it out of a bottle and do it at home or ask your stylist at the salon. 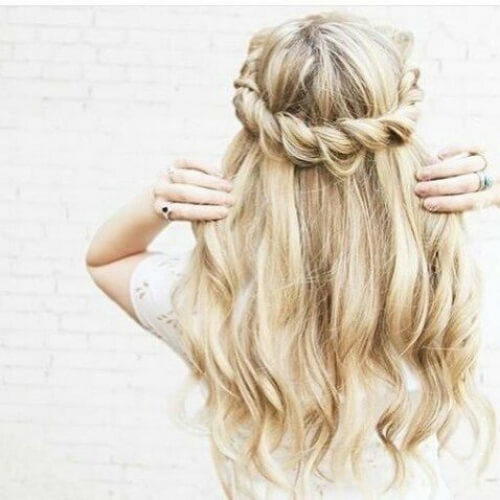 This curly blowout is every girl’s dream! 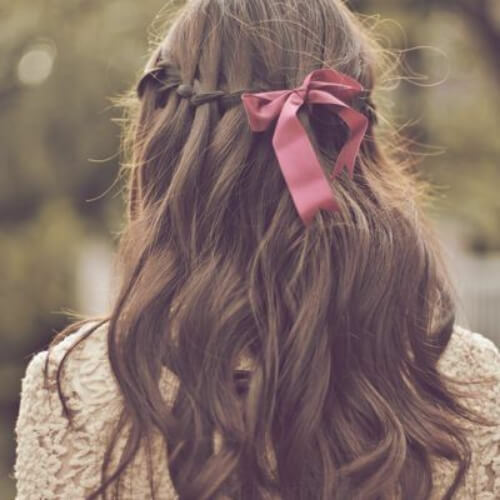 The gorgeous, vintage hair clip at the back can barely hold in place the cascade of curls that flow everywhere. The color is fantastic too. It’s a dark honey blonde with just a bit of caramel in it. If you’re not into blondes right now, how about a nice rose pink? Non-traditional colors are the biggest trend of the year, after all, which means that you absolutely have to try it. We’re also in love with those 90s bangs. 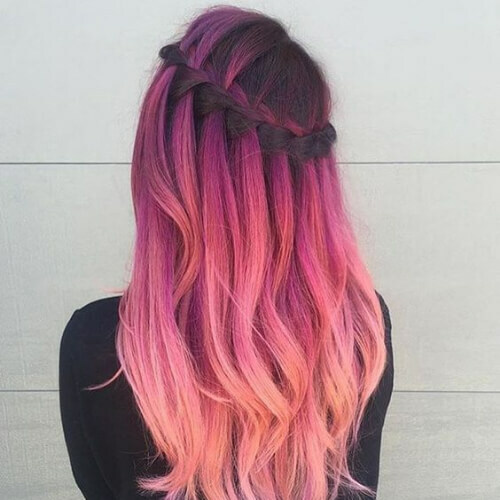 As the name suggests, the color melt trend has you choose a set of colors and then use them to dye your hair in such a way to make it seem as if they are melting into each other. It gets harder when the colors are not complimentary. Here’s an interesting and creative take on this style. 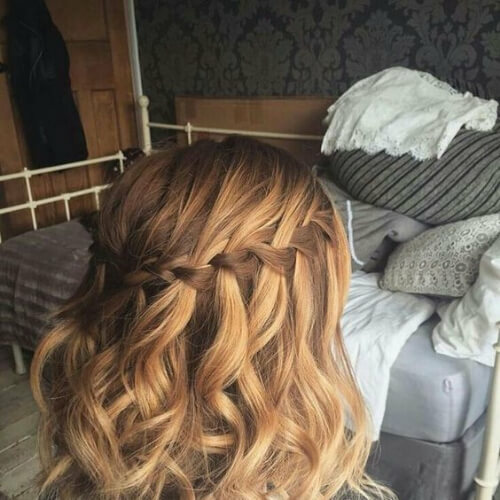 The waterfall braid has been turned into a rose at the back by twisting it several times over and pinning it in key places with bobby pins. It truly looks fantastic! Eggplant is a shade of purple that is both elegant and funky. Here’s a tip, though. 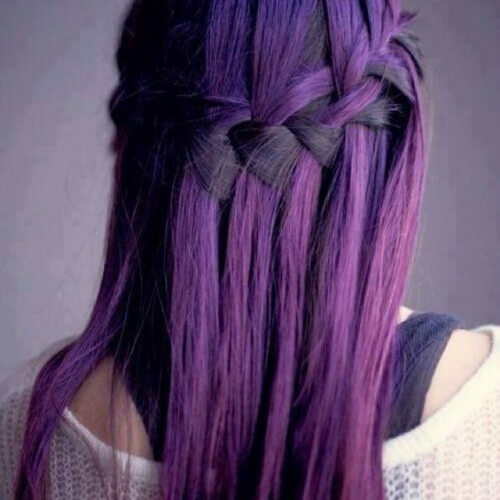 You will have to keep coloring your hair because this color washes off immediately and transforms from eggplant into other shades of purple. 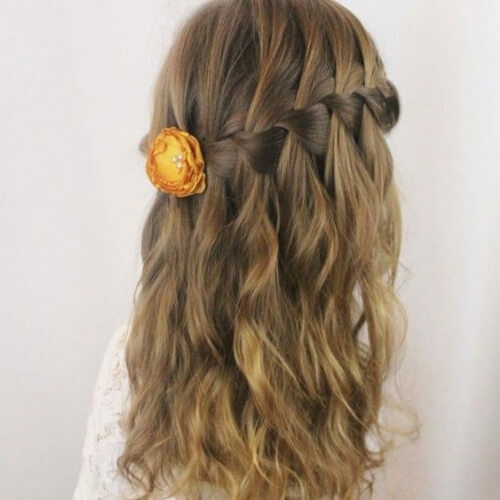 This braid extends down the length of the hair becoming parallel with the ripples that we like to call ‘waterfall.’ It makes for a very interesting, albeit juvenile effect, which means it might be more appropriate for little girls. 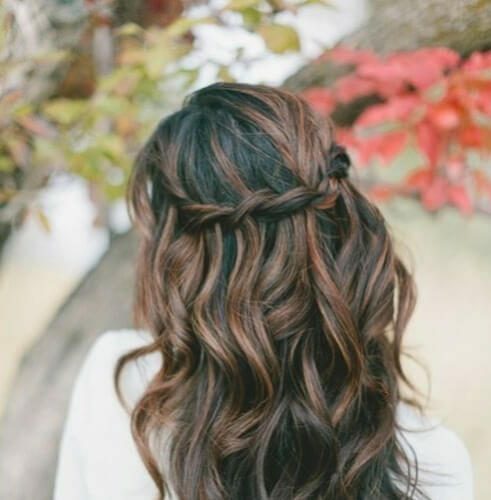 As we’ve seen from the wonderful selection above, the waterfall braid with curls is an outstanding hairstyle that can be worn everywhere, from the office to a wedding and in any season. It all depends on the outfit you’re wearing, how you style it, and the accessories you choose. Let us know the comment section below what you think!